All the Queen's Men's groundbreaking rocktronic blend earned the group a number of honors on their first effort, ?Madame Static?. This double CD pushes the band further into the genre of merging rock, electronica and techno. 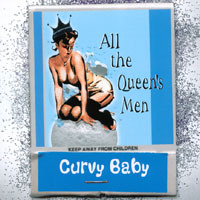 All the Queen's Men's new double CD Curvy Baby could have been subtitled Explorations into Rocktronica, Volume Two. On Curvy Baby, the Boston-based quartet continues its experiment mixing rock and electronica, which they began on their last album Madame Static. "With Curvy Baby, we dug even deeper into our vision of rocktronica," says drummer Tamora Gooding. Adds guitar goddess Catherine Capozzi: "Our idea was to take our mix of rock and electronica to the next level. Curvy Baby is similar to Madame Static, only bigger and more realized." Madame Static received rave reviews in daily and underground press and garnered radio airplay in Boston and Switzerland. A reviewer for the Boston Globe wrote, "Combining tribal beats with astral tones, the band offers an all-encompassing buffet... this album is ready to go from the radio to the rave tent." All the Queen's Men's groundbreaking rocktronic blend earned the group a number of honors. FemMusic.Com called AQM "an alternative band with a ferocious and risk-taking streak" when readers voted it as one of the Top 5 Independent Bands of 2001. In May of 2002, AQM received one of the coveted invitations to perform at the prestigious 24th Annual Rock and Roll Rumble sponsored by Boston's No. 1 rock radio station, WBCN. The group included three remixes on Madame Static. The new release includes an entire second CD featuring remixed versions of the Curvy Baby recordings by eight European and two U. S. DJs. "We liked the remixes on Madame Static so much that we were inspired to remix of all of the songs on Curvy Baby," lead singer/keyboardist Christine Zufferey says. The Swiss native has a connection to the European electronic music scene through her brother Andy, who is one-half of the techno duo Hostage and who lined-up the other DJs featured on the album. Capozzi described the remixed CD as a "real ear-opener" while Gooding says it was like a "second birthing" of Curvy Baby. "It's interesting to hear what elements the DJs emphasized and what their interpretations were," the drummer adds. The new album's title was inspired not only by the feminine figure, but also by AQM's unique musical blend. "Curvy Baby not only describes the beauty of the natural curves of a woman, but also the curves in our music," Zufferey explains. "I like to describe what we do as 'curvy music.' Even though some elements of our music are linear, there are curves everywhere." The ability to "soak up influences from all different directions and spin them into something that's not just a simple collection of derivatives" attracted new bass player Joe Kowalski to the group. "What I like most about Curvy Baby is that it illustrates that boundaries, if they're even acknowledged at all, exist only to be transcended, pushed beyond." As with their last release, Curvy Baby was produced by the band, with Gooding and Zufferey handling the engineering duties. The pair logged over 600 hours at the AQM's Electric Space Blanket Studio. "This record took much more out of us than expected," Zufferey admits. "We worked on it from February till August." Though All the Queen's Men intend to make further explorations into rocktronica, they are nonetheless pleased with the results of their experiment thus far. "Curvy Baby is the realization of an idea that we've been pursuing for a long while," Zufferey concludes. "With the release of this double album, we've taken another step toward our destination." stand it. Great voice and vibe!!!!! !